In many ways, Minnesota’s projections mirror the national demographic trends of an older and more diverse population. Despite being a predominately white state, Minnesota has a significant minority population across many different communities. Looking toward the state's future, programs and outreach supporting older voters and voters from ethnic and language minority groups will only grow in importance. Overall, Minnesota’s total population is anticipated to grow from 5.5 million in 2015 to approximately 6.6 million in 2060, a 20% increase. Between increasing life spans and slowing birth rates, however, Minnesota’s population is set to age considerably over the coming decades. Currently, about 14% of Minnesotans are age 65 or older. However, this age group is projected to almost double in number and jump to comprise about 21% of the population by 2060. Click the age pyramids below to illustrate this shift. While the 2015 pyramid indicates a relatively stationary population, the 2060 pyramid projects a bulging elderly population and a diminished proportion of young people. Similar to the state’s aging population, Minnesota’s minority population is expected to make significant and steady growth. Using the most recent available data from 2009, projecting the state’s racial composition shift from 2015 to 2035 shows a gradually closing gap. Currently, Minnesota is about 81% white and 19% non-white. By 2035, the split is projected to be closer to 75% - 25%. 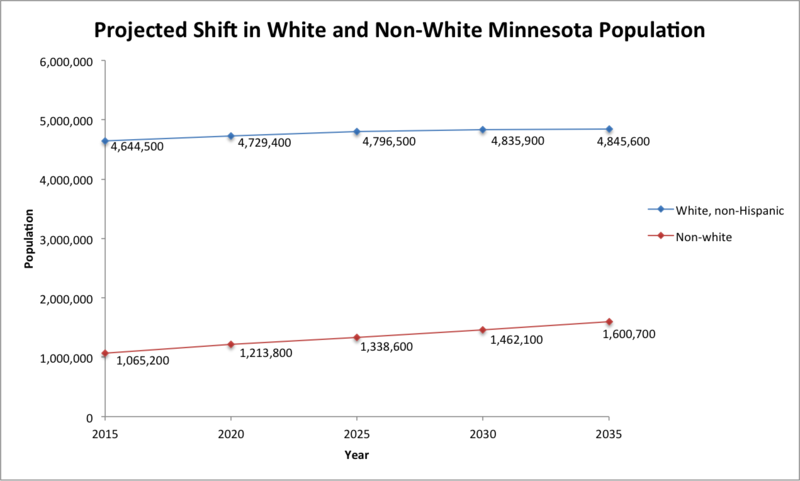 However, the nationwide estimate for 2035 is 53% white and 47% non-white, so Minnesota will likely continue to be a relatively racially homogenous state. Like the United States as a whole, the leading source of minority growth for Minnesota in the coming decades is within the Latinx community. 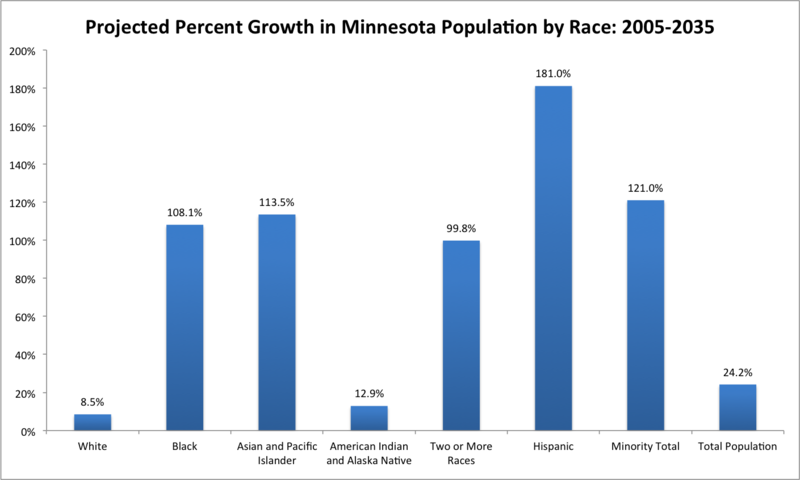 However, there is significant growth projected among Black and Asian and Pacific Islander Minnesotans; both groups are expected to at least double in number from 2005 to 2035. Recognizing these trends now will help all civic engagement groups to identify the populations and areas that will be growing sources of voters, issue advocates and community leaders.